Andrea Locke started as WNY PRISM Coordinator in January 2014, as the first full-time employee of WNY PRISM. Prior to working for WNY PRISM, Andrea worked for The Nature Conservancy, on a large scale, high diversity prairie restoration in Northwest Indiana and for Huron Pines in northern Michigan, where she coordinated a partnership network focused on working with private landowners in order to help implement stewardship on their lands. Lucy Nuessle was welcomed back to WNY PRISM as our new Projects Manager in 2017, after spending a summer with us as one of our Invasive Species Management Assistants in 2015. Prior to returning, Lucy spent a number of years working in the nursery and agricultural fields, as well as the conservation field where she previously worked as a Naturalist Intern at Reinstein Woods and a DEC Giant Hogweed Crew Member. Lucy graduated from University at Buffalo in 2012 with a Bachelor of Arts Degree in Chemistry and Social Sciences. Brittany Hernon started with WNY PRISM in November 2017. 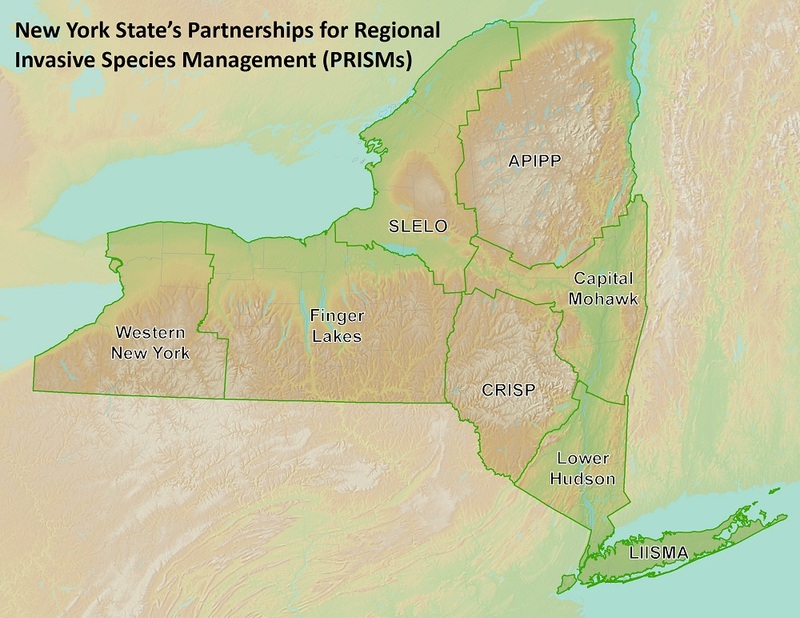 Prior to working with WNY PRISM Brittany worked on invasive species surveys in the Adirondacks and Long Island and species distribution modeling as a graduate student at Stony Brook University. She also worked on hummingbird surveys and nectar studies with the Hummingbird Monitoring Network in Patagonia, Arizona and enjoys volunteering at Reinstein Woods. Brittany completed her undergraduate work at SUNY at Geneseo and received her M.A. in Biological Sciences and Applied Ecology from SUNY at Stony Brook. Kristin King started with WNY PRISM in January 2019 as the new Aquatic Invasive Species Program Manager. Most of Kristin’s previous work has focused on aquatic invasive species spread prevention and coordinating NYS OPRHP’s statewide watercraft inspection program. She has also worked on environmental education projects as a former Park Naturalist for Niagara Interpretive Park Programs and the Invasive Species Education and Volunteer Coordinator for NYS OPRHP. Kristin received her B.S. in Biology with a concentration in Environmental Studies from Niagara University in 2015 and her M.S. in Parks and Recreation Resource Management from Slippery Rock University in 2018. Emily Thiel began her time with WNY PRISM as the Education and Outreach Assistant in 2018 and returned as the Education and Outreach Programs Manager in 2019. She is a graduate of SUNY College of Environmental Science and Forestry with a B.S. in Environmental Studies and a M.Sc. in Environmental Science. Emily has also completed her Master of Public Administration from Syracuse University. Her specialization in invasive species comes from her Certificate in Invasive Species Management from the North American Invasive Species Management Association (NAISMA). Dr. Christopher Pennuto is a professor of biology with SUNY Buffalo State and Director of WNY PRISM. He has had a 20-year career in aquatic ecology and invasive species research with 30 publications and nearly $3 million in external funding. Chris is passionate about stream ecosystem functioning and loves doing insect identifications.